Join us for an exclusive, private track day event at Mid-Ohio, one of the nation's premier courses. Why sign up for an event that affords you 3 to 4 20-minute sessions when you can enjoy the track all day long?!? No run groups. No traffic on the track. Maximize your track experience with us! We'll be limiting the event to no more than 40 cars to maximize the quality of the track time for all of our drivers. Lunch will be provided. Drivers' Meeting from 7:40am - 8am. Track will be hot from 8:00am - 4:30pm, with an hour break for lunch. You don't need to be an advanced driver, but you must have some track experience. We'll begin the day by splitting everyone into 2 groups to ensure there will be no more than 15 cars on the track to provide for an optimal experience. After a few sessions, we'll shift to open track. Yes, we have full corner workers and staff. Yes, we'll be throwing the checkered flag every 30 minutes to give everyone perspective on how long they've been on the track. Passing anywhere with a point-by. We'll have instructors to refine your skills. You should be safe and respectful of others on the track and provide point-bys where appropriate. This is not a test & tune -- it's a social event. When you register, please confirm the car you'll be driving is correct. 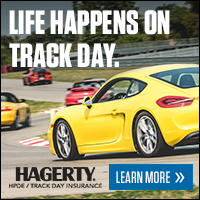 This will be your best track day experience ever. Limited spots available. Sign up today.